I’ll be joining the Classes of the 70’s in another spectacular scholarship fundraiser! 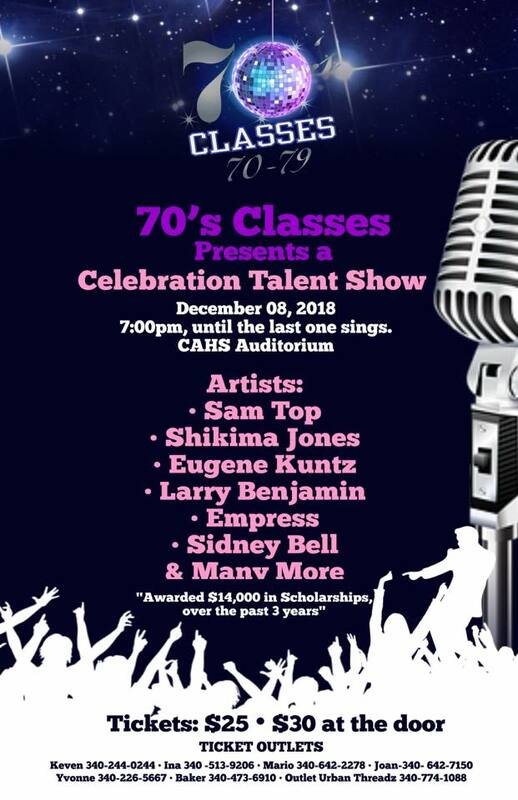 It’s the 70’s Classes Presents a Celebration Talent Show, Saturday December 8, 2018 at the Charlotte Amalie High School Auditorium from 7:00 pm sharp until the last note is sung! The 70’s Classes organizations have raised and awarded $14,000 in scholarship funds over the past 3 years. Be entertained and contribute to the next generation of dynamic US Virgin Islanders! Sidney Bell & many more, including yours truly! Tickets are $25 in advance, $30 at the door. Get tickets at Urban Threadz or call Keven, Ina, Mario, Joan, Yvonne or Baker. Download the flyer for all the details! ← Arsenic and Old Lace at Pistarckle Theater – Don’t Miss It!